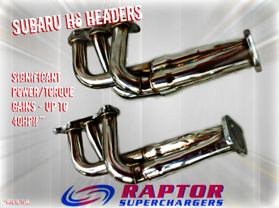 Raptor performance has come forward with an aftermarket header set specially for the Subaru Legacy/Liberty with H6 3.0 engine. Offering torque increases across most of the engine operating range these headers are the very best on offer for a Subaru H6 anywhere in the world. Showing 20kw gain in peak power and nearly 30kw extra at 7300rpm, some very significant torque increases also. Jig welded and laser cut flanges guarantee a perfect fit every time. The headers currently offered are offered for all Liberty/Legacy cars all with 3.0 engine in RHD and LHD. This product is for global distribution - email us at raptorsc@westnet.com.au for your pricing and freight costs. The dyno results shown were after engine was retuned to maximise the potential the new headers offered. Engine was max tuned prior to fitting headers, so gains are entirely due to headers. 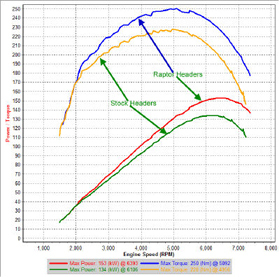 The without tuning the headers offer 5-7kw gains in peak power/torque and huge 20+kw gain at 7300rpm. Tuned by XRT of Barbados.